Located right in the downtown area of Riverside, taking over almost an entire block, is Tio's Tacos, and visiting it will simply amaze you. What makes Tio's Tacos so amazing? Well it's not just the food, which is supposedly generally considered good (I am not a fan of Mexican food), but the sheer amount of eccentric art that is arrayed around the property. Sculptures, hand made fountains, mosaics, a bottle house, and hoards of other eccentric artwork litter the block. The entire thing is the product of Martin Sanchez. Martin Sanchez and his family immigrated in 1984 to the United States from Sahuayo, Michoacan in Mexico. In 1989 he started off with just a simple converted hot dog cart, selling tacos. By 1990, he began renting Tio's across the street from his cart. In 1995 he bought the restaurant, and by 2000 he had purchased adjacent properties expanding the business and allowing him to create even more amazing artwork. Today he owns most of the block. Sanchez doesn't throw anything away, incorporating it all into his artwork. He has hoards of scrap art sculptures made out of wire frames which are then filled in with, well, with a little of everything. Some are filled with bottles, others with cans, some with shells, or shoes, or other things that most people would have thrown out long ago, but Sanchez saved and eventually made a sculpture out of it. And many of the sculptures are huge, towering over those eating on the patio below! Sanchez credits his childhood poverty as the inspiration for his art. Since he never had any toys as a child, he would improvise with whatever he found. Now his art is made out of that which other people would have thrown away or that which he found. Patrons even donate "trash" to him, assisting in his sculpture making process. Old toys that his daughters outgrew are also incorporated into the artwork found on the patio. Additionally, Sanchez also has a beautiful cathedral completely made out of bottles. The rooftops are covered in smaller sculptures and artwork. Even the security lights and cameras have been incorporated into some of his work. In addition to the giant wire framed sculptures filled with "junk" or perhaps from Sanchez's point of view, "treasures" there are other works such as a giant skeleton riding a bike, Popeye, luchador wrestlers, shaped topiary bushes, and other bizarre works spread all throughout the patio. In fact, pretty much every available inch of the property is covered with something! Additionally one can find appliances turned into artwork, bicycles cemented into the pavement, a strange tee pee structure, assorted signs, a bunch of Barbie dolls, and even some robots. 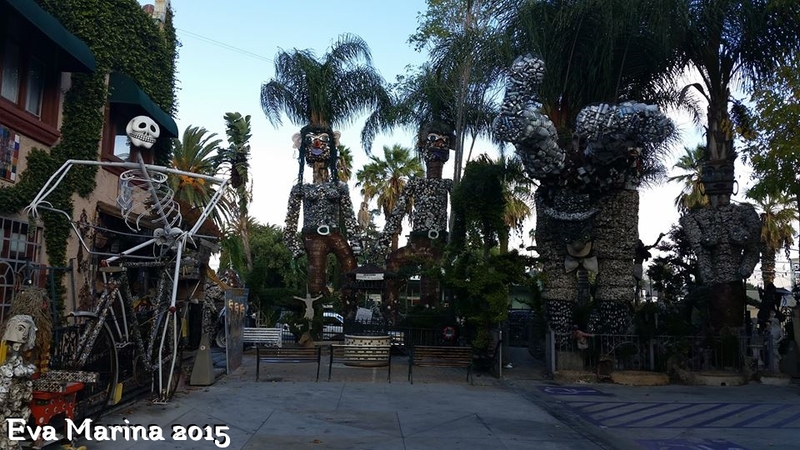 Sanchez's house is even located on the property and also all decked out in his folk art. So stop on by Tio's Tacos, get some food, relax on the patio, and take in the amazing works of folk art!